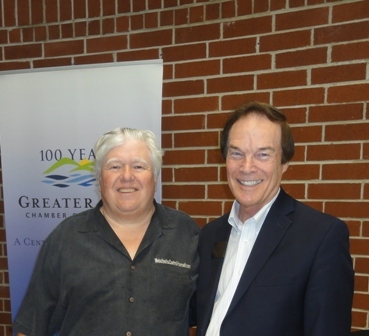 My longtime mentor, friend, and colleague Mike Stewart and I appreciate the recognition the Greater Hall Chamber of Commerce gave us in Business Link, the Chamber’s monthly newsletter. The publication posted the above photo, and thanked Mike and me for the seminar we directed on May 12, teaching participants how to produce top-quality videos using their iPad cameras. The seminar repeated our popular 2014 presentation for the Chamber–one we had given earlier for the Jackson County Chamber in Jefferson, Georgia. This seminar is highly interactive, packed with step-by-step illustrations, and helps even technical novices start producing their own videos for You Tube, Web sites, and the social media. Mike and I welcome invitations to present this video training seminar, and to provide customized individual coaching–not only on video production, but also on other skills that will boost your business. Check our Web sites for more about our services, and our contact information. NOTE: When you visit my Web site, be sure to subscribe to my monthly online newsletter, by putting your name and e-mail address in the slots provided.